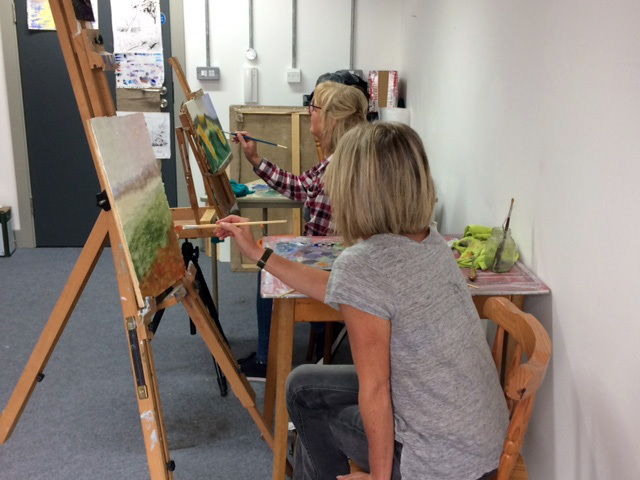 A taster oil painting workshop gives you the chance to try oils in Andrew’s studio and see if it’s something you would like to pursue. Tutored by landscape painter Andrew Barrowman. Andrew has over 25 years of experience painting with the beautiful and versatile medium of oil paint. This session can be followed up with further workshops if desired. The workshop takes place 9.30am -12.30pm morning session or 1pm – 4pm afternoon session. I can do evenings if there is a demand. We usually set up from 9.15am for the 9.30am start or 12.45pm for a 1pm start. The workshops are based in Andrew’s studio at Krowji Redruth, West Park, Cornwall, TR15 3AJ. Workshops are limited to 4 students so there will be plenty of one to one help and tuition. Cost is £25 for the session if you bring your own materials. You would need to bring oil paint. Andrew mainly uses – lemon yellow, cadmium yellow, ultramarine blue, cobalt blue, alizarin crimson, cadmium red + white. Feel free to bring your own colours as Andrew has ‘spare’ paint that you can try. Also a few bristle brushes, a palette knife, 2 small primed boards, canvases, or canvasboards to paint on, a palette or plate, rag or paper towel. You are welcome to bring any mediums you have and Andrew can guide you through how to apply it in your painting. Andrew will provide low odour turps. Feel free to bring your own pochade or table top easel although there are easels available at the studio. Or, £30 if you want Andrew to provide your materials and you would just bring your photo reference, 2 canvases and palette. Wear old clothes and/or bring apron or overall. If you can let me know what materials you will need that would be much appreciated. Book and pay online at www.andrewbarrowman.com/taster-session or contact Andrew to pay by cheque or Bank Transfer. Choose any subject you like although Andrew’s expertise is with landscapes and seascapes. Please remember to bring your own sketch/photo as reference. Don’t worry there will be spares available if you forget! Andrew will begin with a short demo and then everyone will begin working on there chosen sketches and/or photographic reference material. Andrew circulates giving one-to-one advice during the session.